This is one this the biggest ships that Keystone produced. It measures 21″ x 4.5″ and weighs in at three pounds. 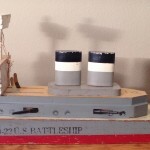 The look of this ship is very similar to model #220 that is in the 1941-42 and 1942-43 catalog. The differences are significant enough that this is either a change in production or a completely different model number that I have yet to come across. The B-22 U.S. Battleship also came in a smaller eighteen inch size. I have a B22 in excellent shape – with plane on front deck.